We're kicking off this series with a profile of Darien Meredith. He has only been publishing his webserial Phantasia since March of 2009, but has been developing the story since 2005, and it's clear that a lot of work has gone into it. To see the other interviews in the series, visit this page. 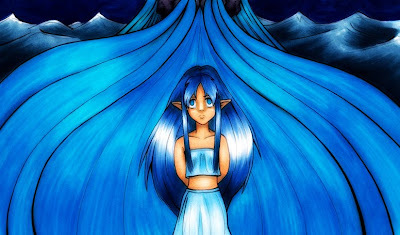 Phantasia follows the journey of a faerie named Phantasia Celeste who is struggling to discover herself. She feels out of place in the faerie world, and travels to the human world in an attempt to understand who she is and the power she holds. Once in the human world, Phantasia enrolls in school and is immediately confronted with the full barrage of angst that is the human teen experience. Can innocent Phantasia cope with the harsh reality of the human world? Something that sets Phantasia apart from other webserials is the multitude of illustrations, drawn by the author, which lend a nice touch to the story. The website itself is laid out nicely, with clear navigation to all points of interest. The webserial is updated at least once a week. Darien was kind enough to answer my questions via email. Without further ado, here's the interview. I first wrote a web serial in 2000 for around a year and a half, but it wasn't very good and I lost interest. I started developing Phantasia in 2005 and began publishing it online March this year after deciding I couldn't keep revising it forever! I've grown up with serialised stories and I've always preferred them to standard novels. Writing a novel has just never appealed to me and everything I've ever written has been in a serial format. When I first published one it just felt like it was the best way to get it to people (most of my friends at that point had left for university) and only found out about other web fiction a short while afterwards. For me I don't think there's any other option! If I sent the concept for Phantasia to a publisher, they would reject it. If the story didn't put them off (or its length!) then the diverges into illustrated territory would. Its one thing to have a Generic Fantasy Cover, it's another to have a chapter cut from text to a scene drawn like a comic... The internet, of course, allows me to do whatever I want! No one telling me "this won't be marketable" or "readers won't like this development". The major drawback is the workload. Having a weekly deadline to meet and knowing there are hundreds of people waiting for you to update can be stressful! Then there's the illustrating, the web design, the bonus content, the advertising and promotion, the interacting with readers... It's not like just writing a manuscript. "Ultimately it will be like Tolkien's collected works on Middle Earth, only far more navigable"
Interacting with the readers is an advantage, though. It gives you direct feedback (and encouragement!) as the story is progressing. There's always the possibility it could reverse, though, and a reader might get irate at a development they don't approve of. It's a niggling worry, but I'm stubborn (arrogant?!) enough not to write just to pander to and please the readers. There are other advantages/drawbacks, but I'm rambling enough as it is. Not currently. The little money I make from adverts goes straight back into helping pay for my own advertising costs. I'm still in this little bubble where the idea of making money off my work seems absurd, even though it's rapidly developing into a full-time job and people tell me I should be making money off of it! I'm contemplating doing some kind of donation-incentive system like webcomics use, and developing some kind of tie-in merchandise (again, like webcomics). I'll get around to self-publishing collected volumes sometime in 2010 too. I'd like to think they'd be in the position webcomics are now, but that will depend on how the tide turns and who's riding the waves. Once e-readers are commonplace, I expect the e-book format to go a similar way to the mp3 (but not as popular, since music is more popular than reading!). I don't see the mainstream grabbing on to serials or web fiction just yet though, as the stigma of "online fiction = not good enough to be published" is going to be difficult to scrap. Don't go into it with the mindset of it making you popular or that you might make a living from it: do it because you enjoy it (but hey, that's a tip for any creative venture!). Of course if you do want to take things to the next level, you need to be prepared to do the research and spend money. DON'T just copy what's popular. I'll admit I've avoided - ignored even - the currents of the webserial communities and just followed my own instincts. It's done me fairly well. I expected to have 10 readers after a year, by next March I'll probably be closer to (or over) 1,000 if current trends are any indication. Then again I have no idea what readership figures are like elsewhere - a thousand could be pittance compared to other serials. But yeah, just trying to mimic what makes another serial popular will get you nowhere: work out what your story is, what its strengths are, and work with them. Don't be afraid to experiment or do your own thing, because that's what will make you stand out in the end. Oh, and remember that a serial is different from a novel. Learn the differences in the way their narrative is structured. Think about the differences between a TV series and a film, for example. Make the most of the advantages the serialised medium gives you, like the wait between chapters and reader debate over what might happen (or what they want to happen). Long-running Japanese comics are a good inspiration for serialisation, but then I've grown up with such things and may be biased. Thanks to Darien for taking the time to answer my questions. To check out his work, be sure to visit Phantasia.